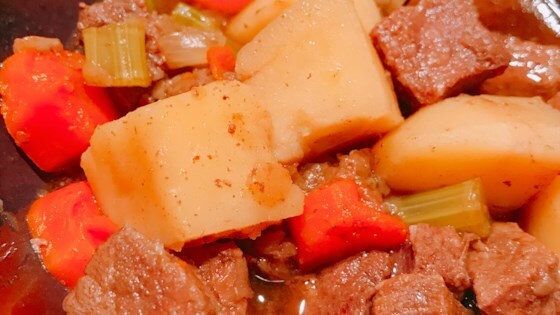 "This is a fairly easy beef stew recipe for the pressure cooker." Heat oil in a pressure cooker over medium heat; add flour and beef. Cook, turning the roast until browned on all sides, 5 to 7 minutes. Pour 3 1/2 cups beef broth into pressure cooker. Add onion, celery, black pepper, salt, and bay leaves. Close cooker securely and place pressure regulator over vent according to manufacturer's instructions. Heat until steam escapes in a steady flow and makes a whistling sound, about 10 minutes. Adjust temperature until regulator is gently rocking. Cook for 20 minutes. Release pressure carefully in the sink under cold water. Unlock lid and remove. Add potatoes and carrots. Replace lid and close cooker securely. Place pressure regulator over vent according to manufacturer's instructions. Heat until steam escapes in a steady flow and makes a whistling sound, about 10 minutes. Adjust temperature until regulator is gently rocking. Cook for 5 minutes. Pour remaining 1/2 cup beef broth into a microwave-safe bowl and heat in the microwave for 3 minutes. Add quick-mixing flour and mix well. Release pressure carefully in the sink under cold water. Unlock lid and remove. Stir in broth-flour mixture. See how to make a classic wine-based stew in the slow cooker. No changes and it’s a simple beef stew, but lacks flavor. Salt and pepper are staples and herbs should be considered.